December 10th marked the U.N. Human Rights Day, celebrating and upholding the indispensable and crucial declaration of universal human rights. On the eve of this event, I visited a refugee camp housing 700 families in Kabul. Conditions in refugee camps can be deplorable, intolerable. Here, the situation is best described as surreal. Inside the camp, primitive mud huts are separated by narrow walkways. When the inevitable snow comes, the ground inside and outside the homes will be muddy until the mud freezes. Plastic has been placed oversome of the doors and roofs, in hopes of providing insulation from the coming cold. Mothers in the camp tell us winter months are unbearably hard. Children become sick at the onset of winter and they don’t recover until spring arrives. People burn plastic, boots, clothing, and water bottles for fuel, but when those resources are depleted, they rely solely on heavy blankets to protect them from the cold. A single water pump serves all 700 families, and the water isn’t even potable. It needs to be boiled for 20 minutes before use. Latrines here are the “traditional type,” simple holes dug in the ground. Our visit was arranged by Nematullah, an Afghan Peace Volunteer. A friend of his teaches informal language and math classes to children at the camp. Nematullah leaned over and asked me to jot down the rights listed in the UN Declaration of Human Rights. I quickly scribbled food, water, shelter, health care, employment and security in my notebook. As we listened to the mothers describe their daily lives, we checked off the rights they have been denied. The women said they do feel secure within the camp. They can go to the latrine without being harassed. 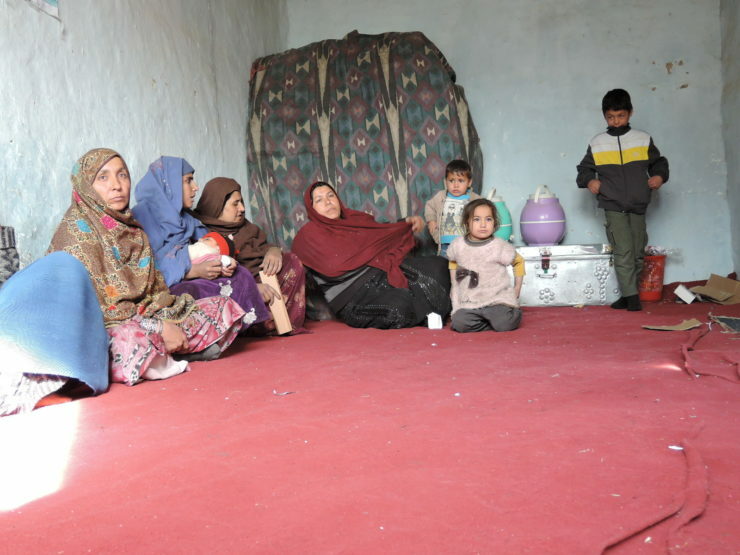 Shojun and her family are relieved to have escaped the fighting in Kunduz. She described nightmare experiences with bullets flying back and forth over and through her house. After fleeing in haste they realized one of the seven children was still in the house. Fortunately, he was saved. She and her family arrived in Kabul with no belongings, only themselves. Shukria, who fled fighting in the Laghman province, showed us the large raw scar tissue covering her inner, upper arm. The Taliban killed her husband 12 years ago. 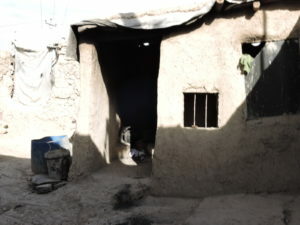 She then married his brother, but two years ago, during renewed fighting between the Taliban and government forces, their home was attacked. Her husband lost a foot. He then left the province, abandoning her and her two children. Shukria says that sometimes she considers suicide but then thinks of the two children. Today, she has no food to serve them lunch. Shukria herself is painfully thin. She shakes her head, and adds because she never has shampoo she washes her hair with detergent and she thinks it’s causing her hair to fall out. Up to the end of 2014, the U.S. had spent more money for ‘reconstruction’ in Afghanistan than was allotted for the Marshall Plan (more than two-thirds of this had gone to build up Afghan military and police forces), yet Afghans remain one of the poorest people in the world. Kathy Kelly (Kathy@vcnv.org) writes for PeaceVoice and co-coordinates Voices for Creative Nonviolence (www.vcnv.org) When in Afghanistan, she is a guest of the Afghan Peace Volunteers (ourjournetytosmile.com). Photos are from the website Voices for Creative Nonviolence where this article was originally posted.